Adrien Broner’s close win over Adrian Granados. Marcus Browne’s dominant win over Thomas Williams… did it leave a sour taste? Rumors of a Manny Pacquiao – Amir Khan showdown upcoming. Anthony Joshua calls out Deontay Wilder for his quality of opposition. – We discuss the latest edition of #PBConNBC including Danny Garcia’s controversial win over Lamont Peterson and the Andy Lee vs. Peter Quillin draw. – We discuss Errol Spence Jr. How good is Spence, and is he potentially a future star in the sport? – While all the talk of what was happening on the #PBConNBC card that’s happening in Brooklyn, the fight of the weekend that took place in San Juan as Rocky Martinez defeated Orlando Salido to win the WBO Jr. Lightweight title. We discuss this back and forth war. – Negotiations a possible Adonis Stevenson vs. Sergey Kovalev break down. – It’s official, Miguel Gotto will next face Daniel Geale in June. – Looks like we have a bout between Timothy Bradley and Shawn Porter that would be an IBF Welterweight eliminator. Well, we might as well not beat around the bush here. Much of the talk following what went down last week centered around the latest installment of #PBConNBC in Brooklyn, specifically Danny Garcia’s controversial victory over Lamont Peterson and the draw between Andy Lee and Peter Quillin. The Garcia – Peterson bout in particular has folks talking with opinions running the gamut as far as who won. Within the mist of the back forth about what happened on the televised NBC bouts, the best prospect in maybe all of boxing was overlooked as well as a dandy of a fight that took place in San Juan with a fighter becoming a three-time world champion. Let’s recap and highlight some of went down last week. 1. 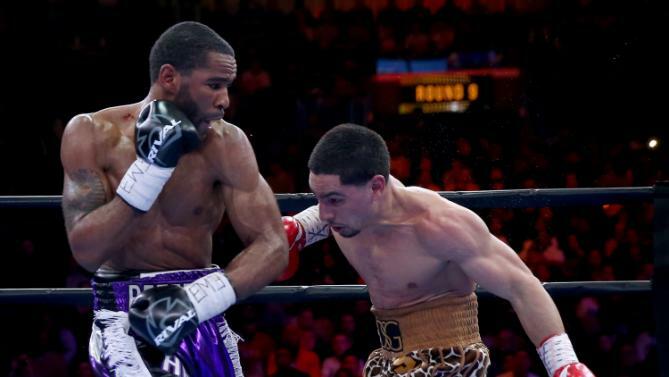 Danny Garcia scores a controversial win over Lamont Peterson – This was the headliner of the #PBConNBC card that took place at the Barclay’s Center in Brooklyn. While both fighters held Jr. Welterweight belts (Peterson was stripped of his IBF title prior to the bout while Garcia currently holds the WBA/WBC and Ring Magazine tiles), this bout took place at an agreed weight of 143lbs. Opinions of this fight are largely based on how you viewed Peterson’t work during the first half of the fight. Either you were among those who felt Peterson (33-3-1, 17 KOs) effectively boxed and moved on Garcia (30-0, 17 KOs) leaving him confused, or you feel Peterson while moving well and making Garcia miss, just didn’t do enough countering to make Garcia pay. Those who feel that Peterson was largely effective early on believe he won and won convincingly. Those who feel that Peterson wasn’t so effective during the first half of the fight feel that while he rallied later on, it just wasn’t enough to overcome the rounds he lost (or gave away depending on your perspective) early on in the bout. That’s the genesis of the discussion because over the second half of the bout it was all Peterson as he changed tactics, taking the bout to the favored Garcia. From round eight on Peterson marched forward, landing punches to the body and head of Garcia, forcing the action. Garcia on the other hand faded and he developed swelling over his right eye. In the end, the judges scored the bout in favor of Garcia by majority decision (115-113 (twice), 114-114). Given the outcome of the bout, will we have a rematch? And if so, will it be at Jr. Welterweight or Welterweight because the reason this was an over the weight bout to begin with was due to the fact that both fighters struggle make 140lbs. In terms of who won this fight lat Saturday night it all depends on your perspective, and the talk in regards to who actually won will continue. 2. Andy Lee and Peter Quillin fight to a draw – When Lee (34-2-1, 24 KOs) and Quillin (31-0-1, 22 KOs) decided to throw punches and engage, it made for pretty scintillating action. The problem was, there were too many moments in this fight where both fighters fought too cautiously and that made this bout uneven in terms of action and excitement. Fighting on the undercard of Garcia – Peterson, this was supposed to be a title defense for Lee who currently holds the WBO Middleweight title. However during the weight-in Quillin couldn’t make the 160lb limit and thus this bout was a non-title bout. Quillin got off to a hot start early as he put Lee on the canvas by way of a right hand with thirty seconds to go in round one. Lee got up, but was hurt again as the round ended. Lee was dropped again in round three and although that knockdown wasn’t a serious, it seemed that whenever Lee landed with a significant shot, he seemed to hurt Lee. While having and advantage early on, Quillin was cautious and failed to step in and it cost him as his periods of inactivity allowed Lee to gain his footing and slowly creep back into the bout. In round seven Lee struck with his vaunted right hook to knock Quillin down. From that point on, Lee started to time Quillin doing a nice job of countering while avoiding the power punches of Quillin and it was his rally during the late rounds that ultimately saved Lee as the judges scored the bout 13-112 for Lee, 113-112 for Quillin, and 113-113 even. While a rematch between Lee and Quillin would be nice, look for Lee to next face mandatory challenger Billy Joe Saunders who stepped aside in order for the Lee – Quillin bout to take place. 3. Errol Spence Jr. continues to roll – Taking place off television after the #PBConNBC bouts, Spence Jr. made easy work of Samuel Vargas, methodically taking him apart in four rounds. Spence (16-0, 13 KOs) is one of the better prospects in the entire sport and in this bout he knocked out an opponent who had never been down as a pro, knocking Vargas (20-2-1, 10 KOs) down in round two before finishing the job with body shots. Spence is immensely talented and it’s time for him to step it up in competition. One thing’s for sure, Errol Spence Jr. has all the talent and it will be interesting to see how far he goes because has the look of a future world champion. 4. Rocky Martinez becomes a three-time WBO Jr. Lightweight Champion – The bout between Martinez and Orlando Salido was the best fight of the week by far as Martinez defeated Salido by unanimous decision (116-109, 115-110, 114-111) to claim the WBO Jr. Lightweight title for a third time last Saturday night in San Juan. When this bout was first announced, you knew this had the potential to be a war, and that what it turned out to be. Martinez (29-2-2, 17 KOs), after being stunned in round two rebounded to put Salido down towards the end of round three by way of a right hand. Martinez put Salido (42-13-2, 29 KOs) for a second time in round five by way of a left hook. Martinez got off to an excellent start. Salido fought hard throughout and used his customary rough house tactics, but Martinez would be denied. Whenever Salido started to gain some momentum Martinez would respond, hurting Salido and neutralizing his attack. Salido finished strong with round eleven being a big round for him, but the constant low blows that Salido had thrown throughout the fight finally caught up to him on the the final round as referee Levi Martinez took a point from him. An outstanding bout and a big win for Rocky Martinez in a clear candidate for Fight of the Year for 2015. Controversy was the word to describe the action last week. Discussion will continue in regards to Garcia’s win over Peterson. Is Danny Garcia getting favoritism from the judges? Has he peaked and is he skating by? Is Garcia becoming the modern day Sven Ottke? The questions in the aftermath will surely go on for a while, at least until the next controversial decision happens.